We have previously featured illustrator Ulises Alfonso Farinas in several occasion (Batman Loses, Lego version of Doctor Who, as well as that of DC, Marvel, and the Star Trek Universe). 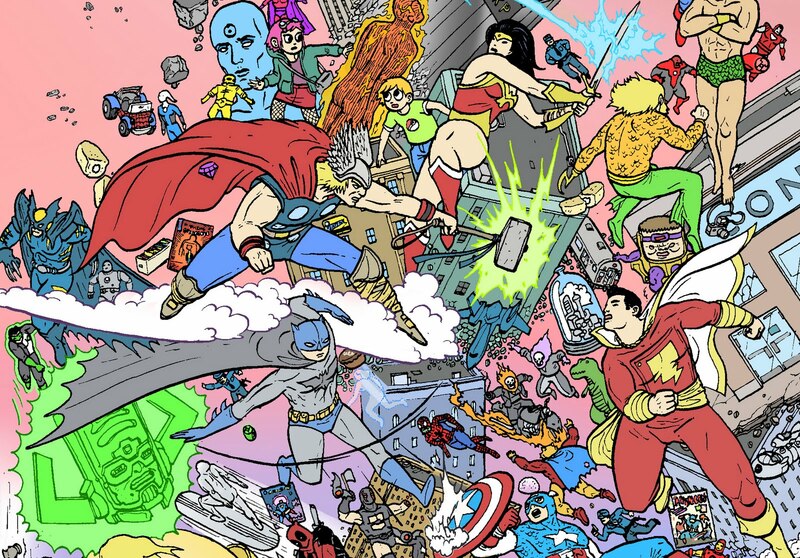 And now behold his magnum opus... A massive battle mural pitting the DC Universe against the Marvel Universe (with a few Amalgam characters thrown in for fun sake). Commissioned by Comics Alliance to commemorate the upcoming 15th anniversary of the Marvel vs. DC crossover, Ulises Alfonso Farinas came out all guns ablazing to bring us this incredible battle mural art featuring the superheroes from the DC Universe and the Marvel Universe going mano-a-mano against each, with some characters from Amalgam (the meta-universe co-created by DC Comics and Marvel Comics where the two comic book publishers merged their characters to create new ones during 1996's Marvel vs. DC series) thrown in for good measure. What's more, Comics Alliance is challenging fans to take on a game of spotting hidden characters and items, all in the totally non-copyright infringing spirit of the Where's Waldo books. Main mission of the game: Find the Invisible Woman. Hint: This would have been totally insane have I not been paying particular attention to Batman after checking out Farina's Batman Loses. 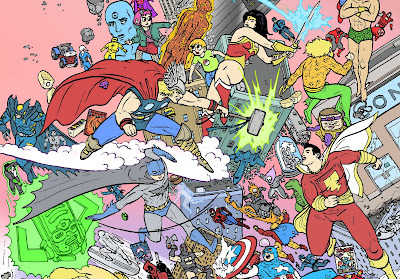 For those interested in the Where's Waldo quest, do check out the vastly superior hi-res version at Comics Alliance.